THE BOUND AND gagged bodies of 26 young men were found dumped yesterday in the heart of Mexico’s second-largest city. Experts said the grisly find could mark a new stage in the full-scale war between the country’s two main drug cartels, Sinaloa and the Zetas. The bodies were stuffed in two vans and a pickup truck abandoned on an expressway near the Millennium Arches in Guadalajara, one of the most recognizable landmarks in the picturesque city that hosted last month’s Pan American Games. Most of the men died of asphyxia, according to officials in Jalisco state where Guadalajara is located, though initial reports indicated some had been shot. The victims, apparently between the ages of 25 and 35, all had the words “Milenio Zetas” or “Milenium” written on their chests in oil, said Jalisco state Interior Secretary Fernando Guzman Perez. A law enforcement official who was not authorized to speak on the record said the writing was apparently meant as the killers’ calling card, identifying the assassins as being from the Zetas and a smaller, allied gang, the Milenio Cartel. The official said a banner found in one of the vehicles – whose contents Guzman Perez refused to reveal – was in fact signed by the Zetas. Mexican cartels frequently leave threatening messages with the bodies of their victims as a way of intimidating rivals and claiming responsibility for their actions. The killings, apparently carried out before dawn, bore an eerie similarity to the September 20 dumping of 35 bodies on an expressway in the Gulf coast city of Veracruz. 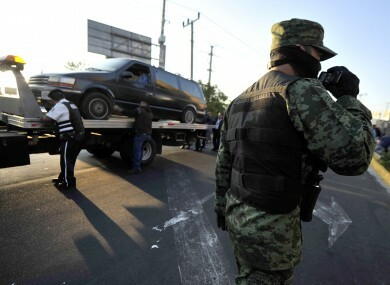 The victims in the Veracruz mass slaying were purportedly Zetas and the killers were allegedly linked to the Sinaloa cartel; those two cartels have emerged as Mexico’s most powerful, and have each been trying to expand into each others’ territories. Raul Benitez, a professor at Mexico’s National Autonomous University who studies security issues, said the Guadalajara mass killing may have been retaliation for the Veracruz slayings. “I think the Zetas are responding by giving back in kind … it is a game of one-upmanship,” said Benitez. Email “Bound and gagged bodies of 26 men found after Mexico massacre”. Feedback on “Bound and gagged bodies of 26 men found after Mexico massacre”.